Greet your dear ones with this Essential Bathing Assortments Gift Basket for Her and make them feel special, loved and lucky. 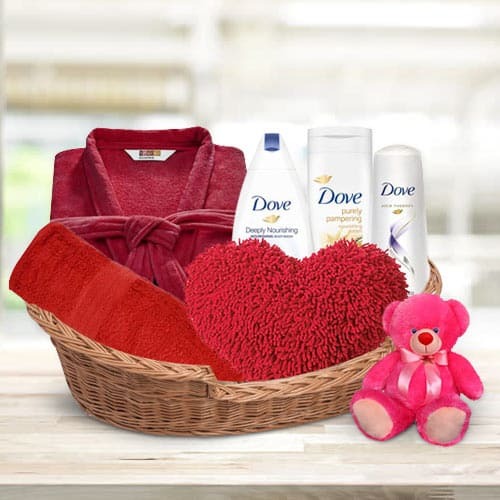 These gifts are sure to bring much delight to the recipient as it is consisted of 1 Bath Gown (large), 1 Face Towel, 1 Heart Shape Cushion, 1 Small Teddy Bear, 1 Dove Conditioner, 1 Dove Body Wash and 1 Dove Body Lotion. All these items are placed in a Cane Basket.